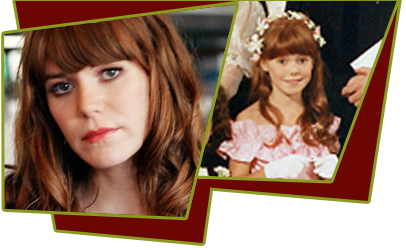 Jenny Lewis, who played Becky in the ill-fated Life With Lucy series, made her debut in a Jello commercial, then starred as a child in a number of films during the 1980s. In 1999, she formed the indie rock band Rilo Kiley along with her friends Pierre De Reeder, Blake Sennett and Dave Rock. She also provided background vocals for Give Up, the debut album of The Postal Service. The former actress counts roles in movies like Shelley Long's "Troop Beverly Hills" and the bad-girl epic "Foxfire" (which featured future Oscar-winner Angelina Jolie). Besides appearing in Life With Lucy her appearances on TV include "Growing Pains" and "Rosanne" as well as in the episode 'If She Dies' on "The Twilight Zone" in 1985. Appearing in Life With Lucy where she played Lucille Ball's granddaughter, Jenny Lewis said "Yes, Lucy was a bit rough around the edges, and yes, she constantly smoked cigarettes on the set. She would pull her face back with tape, sort of like a cheap face-lift." Their first CD was the critically acclaimed Take Offs and Landings, released in September 2001 by Seattle's Barsuk Records. Featuring Lewis, Sennett, bassist Pierre de Reeder and drummer Dave Rock (who has since been replaced by Jason Boesel), the home-made recording fit nicely next to music by label mates Death Cab for Cutie, who often shared the stage with the band. It wasn't until they were out touring Take Offs, that the Los Angeles natives began a relationship with Saddle Creek Records. The product is The Execution of All Things, Rilo Kiley's just-released Saddle Creek debut, produced, mixed and recorded by Mike Mogis and featuring guest appearances by a handful of Saddle Creek regulars including Kasher and Cursive band mate cellist Gretta Cohn, The Good Life's Ryan Fox, and Bright Eyes' Conor Oberst and Jiha Lee. Not to mention Mogis' multi-instrumental touches on pedal steel, vibraphone, banjo and glockenspiel. As a performer, Jenny Lewis comes from the Jenny Toomey/Aimee Mann school of perky, personal singer/songwriters whose sweet, mature voices emote honesty without shortchanging the rock. Rilo Kiley songs are confident-yet-cynical pop tunes draped oh-so-slightly in melancholy and longing. She equated her TV debut on Late Night with Conan O'Brien (October 6, 2004) to the being naked in a school dream. "It's your first TV appearance and you're naked, and Conan O'Brien is there and he's so much taller than you. And you feel short and sad, because you're naked and short."